Olivia Navarro-Farr, Ph.D. (B.A. 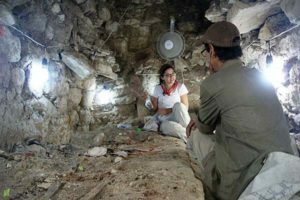 ’98), and a team of archaeologists made a career-defining discovery in the summer of 2012: In a collapsed chamber in Guatemala was the tome of Lady K’abel, a powerful Maya queen who ruled the ancient city of El Peru-Waka’ with her husband more than 1,300 years ago. 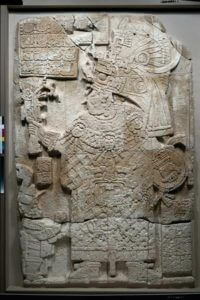 Navarro-Farr has spent the past 10 years visiting and studying the site of an ancient Maya city in Guatemala. Its palaces, plazas and residences now lie in rubble, but one of its buildings still contains relics, tokens and other offerings left by people centuries ago. 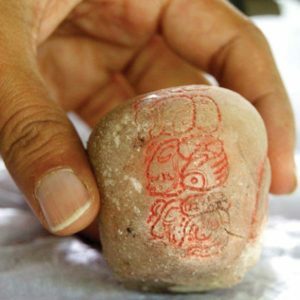 “This is one of only around five royal burials in the Maya world that have associated epigraphic (inscriptional) evidence that gives the historical identification of the individual,” she said. “We spent long days on our sides, under cramped and uncomfortable circumstances,” said Navarro-Farr of working on El Perú-Waka’ Archaeological Project. Her team worked tirelessly despite the physical strain because, as more and more valuable artifacts were uncovered, looters threatened to move in. Navarro-Farr’s group had the cooperation of the Guatemalan army, which was camped nearby for protection, but even that did not guarantee the site’s security. Thieves were not the only risk they faced. As the rainy season began, the makeshift roads that weaved through the forests quickly turned to mud. But after four months, the team had unearthed the remains of the powerful Maya figure whom history had only known through the objects and works of art that referred to her. 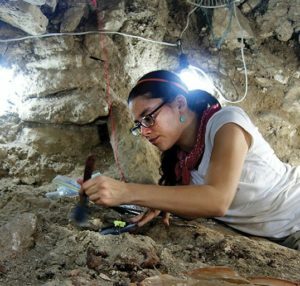 Navarro-Farr’s lifelong interest in Prehispanic Mesoamerica and her experience working side-by-side with indigenous peoples in Guatemala helped her grasp the weight of this discovery – both in and out of the history book. In many ways, the archaeologists’ work had only just begun. The news of Lady K’abel was broadcast to the public, but many Guatemalans live rurally with limited access to this kind of information. Indigenous communities were even more disconnected due to language and other barriers. Navarro-Farr often reflects on the roles that ethics and values play in her field, especially when she gives lectures to Guatemalan communities on her findings. She watches as the people become more connected to their own history. St. Mary’s is also where she first tried her hand at a dig: She went to Belize with The Maya Research Program as an undergrad and found herself spearheading excursions to archaeological sites that weren’t even on the itinerary.